If you are trying to find the best red light therapy devices, you are probably already aware of the many different conditions and symptoms it can treat and soothe. Unsurprisingly there is a huge number of products available. In fact, if you type “red light therapy” into Amazon, you will get over 3000 results! All these products are intended for slightly different purposes, so it’s not surprising if you feel a little overwhelmed at choosing which one is right for you. So we are here to help. We’ve rounded up the best products on the market for several of the most popular uses of red light therapy and reviewed them to help you make a decision about which one is best for you. So it is hardly surprising that those who have tried it swear by the therapy, or that there are so many products available! No matter which symptom you are trying to reduce, you will be spoilt for choice for products, so take a look at our reviews to find the right one for you. 11 What Is Red Light Therapy? 11.2 What Does Red Light Therapy Do? 12 What Are The Benefits Of At Home Red Light Therapy Treatments? 12.1 How Much Does Red Light Therapy Cost? 12.2 Is It Worth It? 13 How Does Red Light Therapy Work? 13.1 Are There Any Side Effects? 13.2 What Are The Best Red Light Therapy Products? 14.4 Is Red Light Therapy Effective? If you need more information about red light therapy before looking at our reviews, we included a buyers guide. EDITOR’S CHOICE (Wand): From our research, we believe the LightStim For Wrinkles is the best all-round red light therapy device. It’s intelligent, multiwave patented technology, and versatility set it apart from the rest. 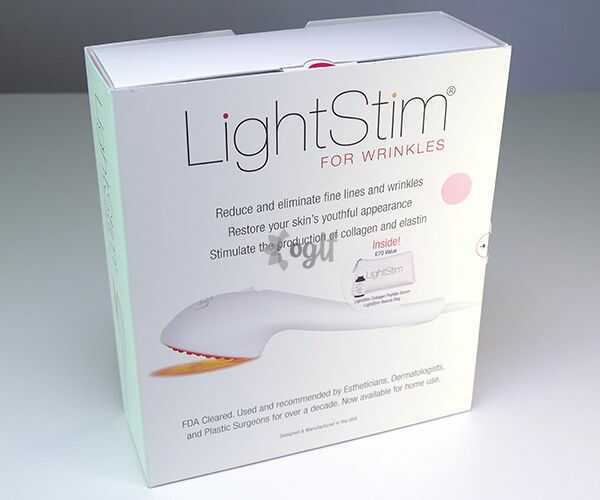 The LightStim For Wrinkles is an award-winning, FDA-cleared red light therapy device which will improve your skin by encouraging your skin’s natural collagen and elastin production. It can be used on the entire face and is suitable for all skin types. It is a fantastic product which will restore your youthful appearance by eliminating fine lines and wrinkles. The LightStim has been a top contender in the red light therapy market since 2002, winning several awards, including the Pure Beauty Award and American Spa Professional’s Choice Award. You know you are getting a quality product from LightStim. 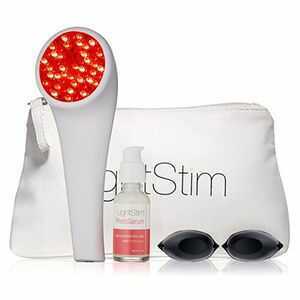 The kit includes the red light therapy device with plug, goggles, photoserum and a trendy bag to keep it all it. Lightstim has advanced LED technology from NASA and created a patented, Multiwave technology. This means that it emits several different wavelengths (colors) of light at once – amber, deep red, light red and infrared. Your skin absorbs these different wavelengths of light at different depths, so this Multiwave Technology treats your skin deep within the tissues. This means it is a non-invasive treatment which makes your skin healthier from the inside. The diameter of the treatment area is 3” (7.5cm), yet it has as many as 72 LEDs on that surface, giving you the maximum coverage for the best results. This red light therapy device is extremely easy to use. Simply plug it in, and you are ready to go! It is mains-powered, so it maintains a constant output, giving you consistent treatments. It weighs only 1.1lbs (499g), and it is very comfortable to hold. You may even find it soothing to use! The LightStim has a built-in 3-minute timer, which means that you can sit back and relax during your light therapy session, rather than keeping an eye on the clock! It also has an automatic shut off after 30 minutes in case you accidentally leave it switched on. To get the best results, the instructions suggest you use your LightStim 5-7 times per week until you reach the results you desire, and then cut it back to just maintenance sessions. The LightStim is FDA-cleared for use all over the face. Among other wavelengths, it emits infra-red light, which will feel warming on your skin. While this is soothing, you should take care not to stare at the light source as the glare can cause you discomfort. To make sure your eyes are protected during your red light therapy sessions, the LightStim kit includes goggles which are comfortable to wear and effective. We would always recommend using these goggles, even if you are not treating your eye area. We love the LightStim! It is comfortable to hold, easy to use and will give you great results. We also love that there are different versions which are specially designed to treat different symptoms, so you can also get a LightStim to solve your pain, or your acne too. The safety goggles are a great addition to the set, giving you the confidence that your safety is at the heart of this product. EDITOR’S CHOICE (Full Body Panel): The Joovv Solo is a large, FDA-approved, full-body red light therapy system. It is a fantastic design that gives you clinical-grade irradiance (power) and offers you the choice between red light, near-infrared light, or both together for your treatments. Its technology is optimized to make it the most effective light therapy device on the market, and its modular design means that you can build up your system to personalize your treatments perfectly. At first glance you may think that its large size, clinical-grade power and intuitive treatments stand it apart from the rest, but in fact it is the results that speak for the JOOVV. It is endorsed by Olympic and NFL athletes, world renowned nutritionists and fitness trainers …the list goes on. So we were very happy when we had the opportunity to try the Joovv Solo out! 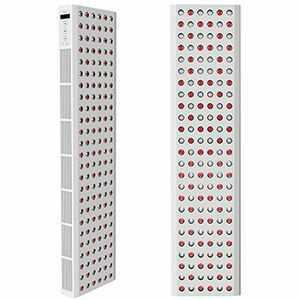 The Joovv Solo is a large panel design (8.75 inches by 35 inches) which is considerably larger than the other red light therapy devices we have discussed. It also therefore has far more lamps (150 electrostatic-coated LEDs), which emit red and near-infrared light. It gives you a high-quality output, meaning that you can save time with shorter treatments, without compromising on the quality that you receive each session. Being a large design means that you can treat a wide area of your body at once, rather than being limited to the small spot size that hand held devices have. At 5 foot 7 inches (170 cm) tall with a slim frame, and standing at the recommended distance of about 6 inches (15 cm) from the device, the output from the Joovv Solo reached from my face down to my mid thighs and just to the edges of my arms, so it has excellent coverage. But one of the features of the Joovv that truly sets it apart from other red light therapy systems is the modular design – meaning that you can link up several devices for even greater coverage. For example, you could add a second below to lengthen the treatment area, or you could add another to one side if you want wider coverage. When set up correctly, the devices will automatically pair so that they then work from one control panel, and if linked to the app, you have one-touch control over all the devices. If you know that you want greater coverage, you can opt for a larger Joovv system. For example, in addition to the Joovv Solo, there are different kits that you can buy which include different numbers of Solo panels for more coverage. For example, the Joovv Quad has 4 panels, while the Joovv Elite has as many as 6 units. Alternatively, if you want to start out with one and then find you want more, you can have it! It is easy to get more and add them on. This means that it is extremely easy to upgrade your setup at any stage. If you are tight on space and would prefer a smaller version, the Joov also comes in a desktop version known as the Joovv Mini. It is 8.75 inches wide by 15 inches long (22 cm by 38.1 cm) and comes with both a door mount and tabletop stand. 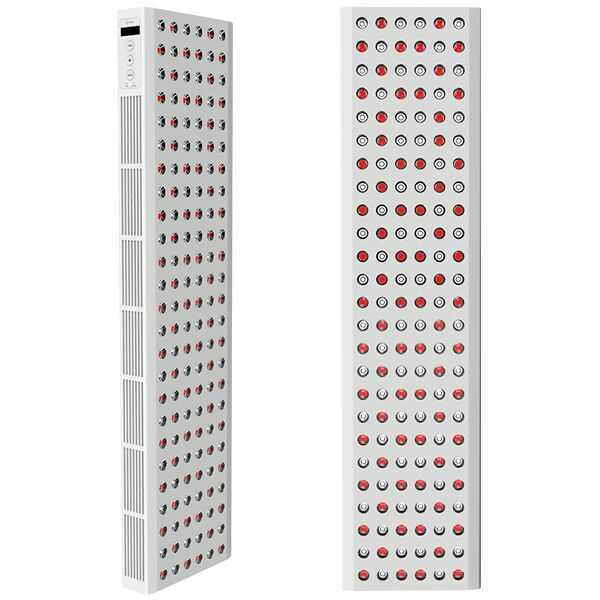 It has fewer LEDs to account for the smaller size (60 in total), but the technology is the same and it still has the modular design. 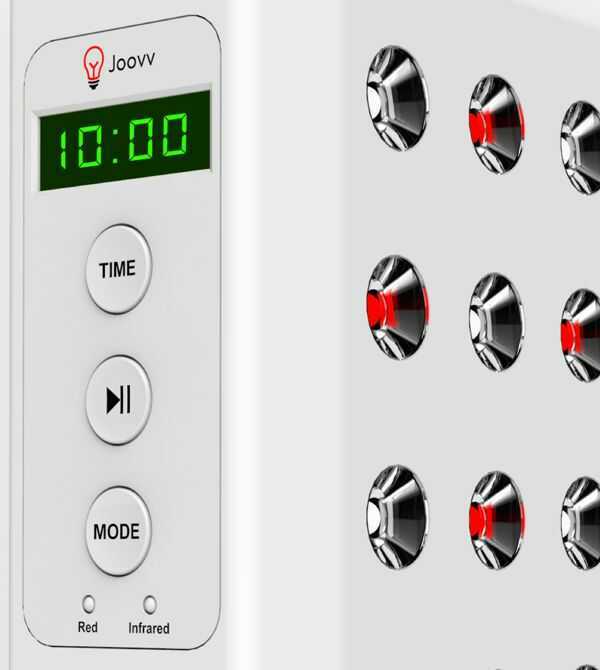 It is incredibly easy to set up your Joovv Solo – it took us about 5 minutes from opening the box to hanging it up and switching it on. It comes with everything you need to set it up, including an Alan key and a door mount. The comprehensive instruction manual easily takes you through how to mount it on the door and start it up, with more guidance further on in the booklet if you are setting up more devices together. Just one person can do the majority of the setup, but it is worth having a second pair of hands to lift and support it as you attach it to the door mount – which only takes a few seconds. The design of the door mount system means that you can easily raise and lower your device to suit the height of different people, so you can easily adapt it once it is hung. The Joovv Solo is able to produce both regular red light which has a wavelength of 660nm and near-infrared light, which has a wavelength of 850nm. The output it delivers is clinical-grade power, known as irradiance, and when combined with the correct distance from the source during treatments, clinical studies have found that this output is optimal for producing health benefits in both your superficial and deep tissues. Joovv has been rigorously tested by the FDA and is indicated for relieving pain and stiffness that is associated with arthritis and as well as muscle spasms and minor muscle and joint aches. For each session, you can choose between the two different wavelengths, which give you slightly different benefits, or you can use both at the same time for maximum benefits! For example, if you are using red light therapy to enhance muscle recovery or soothe joint pain, infrared is the more suitable setting because it is able to penetrate deeper through your body tissues. It is worth noting though that near-infrared light is invisible to the naked eye, so it will look like the lights are not turning on. On the other hand, if you are using red light therapy to benefit your skin health, the regular red light is more suitable. This is because it is better absorbed by the more superficial skin cells that enhance collagen production. This choice gives you far more control over your treatment sessions than other red light therapy devices, and we love that you can choose to operate both types at the same time for an even more comprehensive treatment. Just like the setup, the treatments are very easy and intuitive too. Once you have turned the device on, the control panel on the side displays the default treatment time, which you can adjust by pressing the ‘time’ button. You can choose treatment times of between 1 and 20 minutes. The recommended treatment time for optimizing cellular health is 10 minutes per session, at a distance of 6 inches (15 cm) from the device. The treatment mode selection is also on this control panel. It will automatically select both red and near-infrared when you first switch it on, but by pressing the ‘mode’ button, you can toggle between them. Don’t forget that near infrared is not visible to the naked eye, so if you select just near infrared, you won’t see the light coming out. Once it is set up correctly, you are ready to start your treatment. Simply press the ‘play/pause’ button to begin! You can easily pause the treatment and any time then resume it when you are ready. One recommendation we have is that you wear eye protection. While the user manual states that eye protection is not necessary, the LEDs are extremely bright, and the glare can be uncomfortable, even with your eyes shut. Therefore, we recommend purchasing some blackout goggles to cover your eyes during treatments. For us, this made the light therapy much more relaxing, and you can even put on some gentle music to give yourself an even better spa experience during your red light therapy sessions! Just like an increasing number of devices and commodities, “there’s an app for that!” The Joovv Red Light Therapy App pairs with your device – or multiple Joovv devices if you have more than one – via Bluetooth, giving you one-touch control of your treatments. It works on both iOS and Android systems. 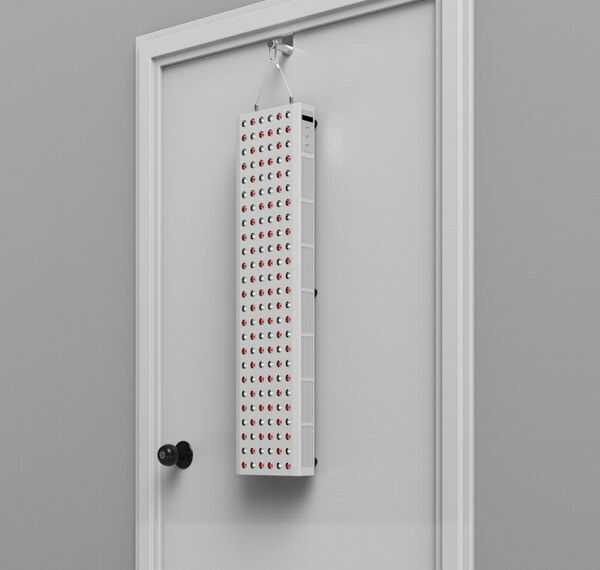 With this, you can set a weekly target and keep track of past sessions, as well as monitor your statistics of light therapy you received – red vs. near infrared or combined. Red light therapy is an enjoyable experience anyway, but the app makes it even more interactive and in our opinion makes it more likely that you will continue your treatments, which is important when it comes to light therapy, as consistency is key. Overall, we think this is an excellent red light therapy system. It can benefit your whole body with its wide coverage, and we love that you can upgrade it and link up other devices to increase the treatment area. It is extremely easy to use and we love that you can track your treatments on the app! Overall, we definitely recommend this red light therapy device. 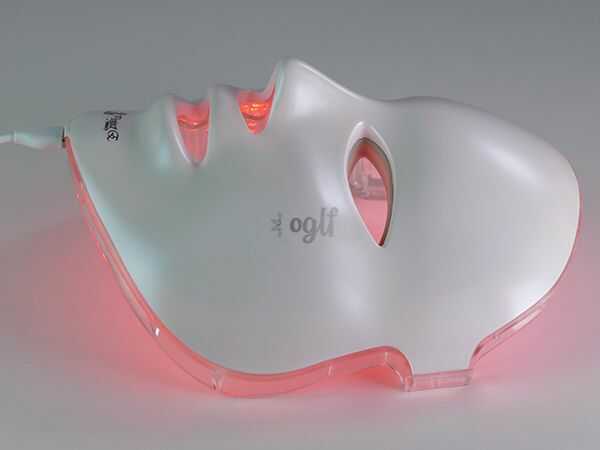 EDITOR’S CHOICE (Mask): If you are solely looking for a red light therapy device to treat your facial area, then this is the product for you! From the masks we could find, we believe that this is the best one available. The different colors you can select for your treatment mean that it is extremely versatile. 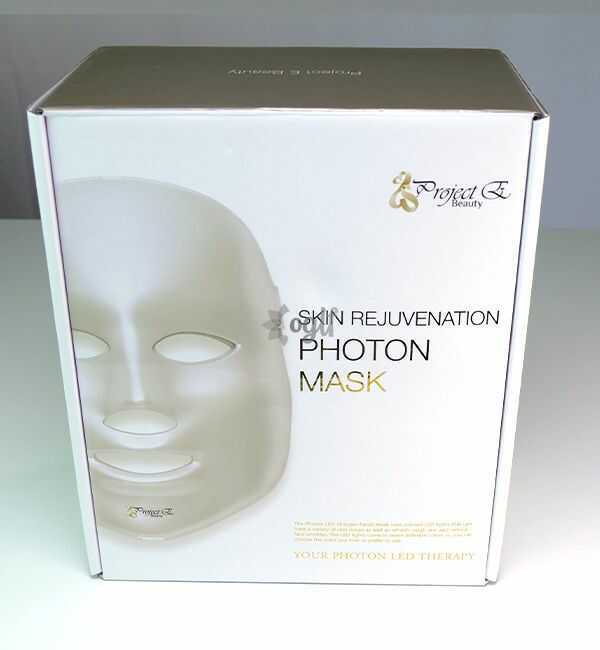 The 7-color LED Photon therapy Facial Beauty Skin Care Mask from Project E Beauty is a brilliantly-designed LED mask designed to treat a huge range of skin conditions and complaints. It can reduce and prevent the appearance of fines lines and wrinkles, fight fatty areas, inhibit the development of melanin pigment and improve the elasticity of your skin, resulting in a healthier, more youthful appearance. 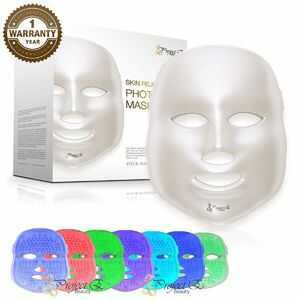 As suggested by the name, you can choose between 7 different colors when setting up your mask for a treatment. These colors range from 390nm (purple) to 650 nm (red), and each is chosen because it brings special benefits to the skin. For example, you can select red, which is one of the most effective colors at increasing blood circulation and stimulates collagen production for anti-aging, while cyan is good for soothing inflammation and purple is relaxing and improves lymph metabolism. The mask is very easy to use. After washing and drying your face, you simply switch it on, choose your color and set the timer, before putting it on your face. With a shipping weight of 2.8 pounds (1.3 kg), it is fairly heavy, so to prevent discomfort it may be best for you to lay back and relax during your treatment, but you can see out of the ‘eye holes’! A suggested treatment plan from the manufacturers is 10-15 minute per session, with 3-4 sessions per week, which you can reduce to 1-2 per week once you achieve your desired results. Included in the set, you will find the LED mask, remote control, USB cable, power cord and a comprehensive user guide. Project E’s mission is to provide “world class excellence’. They pride themselves on the strict quality control guidelines and standards that their products must conform to, so you know you will be getting a superior product. The lights are all LEDs, and the mask is effective at all intensity levels, so you don’t necessarily need to choose the top setting to get results. As everyone’s skin is different, we recommend starting at the lowest intensity and increasing it if you need to. Overall, this incredibly versatile mask is a great choice for a wide range of facial conditions and complaints. Yes, the contoured design means it is less suitable for also treating other areas of your body, but it does mean that all the curves of your face will be treated, giving you a brilliant result. EDITOR’S CHOICE (Hair Loss): If you are looking for a chemical and drug-free solution to your thinning, receding hair or baldness, then this is the red light therapy device for you. It uses clinical-strength laser technology and produced outstanding results in the 2017 clinical trials. 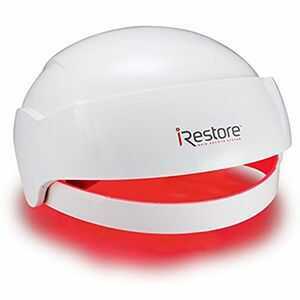 We believe that this is the best hair growth red light therapy device around. The iRestore is an FDA-cleared hair growth system which uses laser, red light therapy to encourage the growth of thicker and healthier hair. It is a non-invasive solution that is indicated for treating androgenic alopecia. It can be used alongside your other hair loss products, as it is believed to enhance the results you see from them too. You can expect to see results between 3 and 6 months after beginning your treatment. The technology is a clinically-proven method of restoring hair growth, and the results that were shown in the 2017 clinical trial were phenomenal. The 100% of the participants experienced significant hair growth, including an average increase in hairs of 43.23%! The lasers use light which has a specific wavelength of 650nm (red light), which is clinically proven to enhance hair growth. There are 51 medical-grade lasers in total that emit light energy which the hair follicles absorb. It is thought that the absorbed light speeds up the rate of cell metabolism and reactivates the follicles, thereby stimulating hair growth. You will find the iRestore laser hair growth system very easy to use. You simply place it securely on your head and you are ready to begin. It has a clear timer display which enables you to start, pause and resume your treatments. At the end of the session, it will automatically turn off, so you cannot overtreat your hair. Manufacturer’s advice is to treat your head every other day for 25 minutes per session. The helmet sits comfortably on your head and is lightweight yet durable. 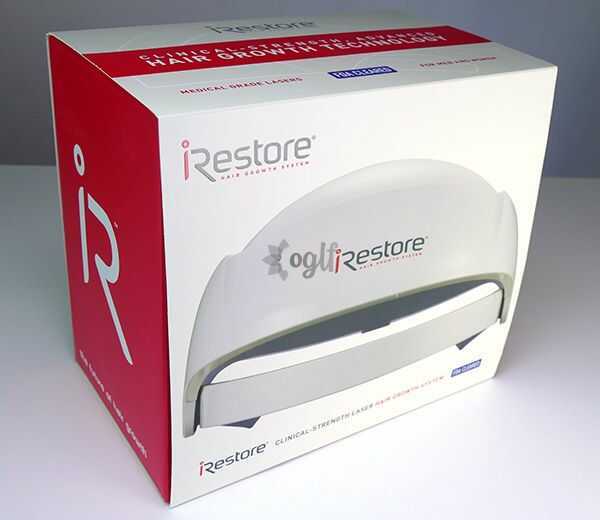 The iRestore is FDA-cleared to treat androgenic alopecia (genetic hair loss). It is a chemical-free solution for your thinning or balding hair, although it can be used alongside other hair growth products. The iRestore is a safe and drug-free, but it is a laser device, so you do need to exercise some caution and simple caretaking. Persons under the age of 18 should not purchase this product. It should not be used on wet hair or by those who are sensitive to light. Please refer to the manufacturer’s guidelines for more information. If used correctly, the iRestore helmet is a safe product that can give you great results, as shown by the recent clinical trials. We think this is a great solution for hair loss. It is comfortable to wear and lightweight, despite being durable and extremely effective. We love that it can be used alongside your usual hair growth products to enhance the results further. The results from the recent clinical trials speak for themselves – it’s not often a product has a 100% success rate! The Baby Quasar PURE RAYZ Skincare Therapy Device is the product for you because it helps to reduce wrinkles and build new collagen. It’s gentle enough for all skin types and tones. Baby Quasar Pure Rayz Skincare Therapy Device uses advanced technology to emit only natural wavelengths of light. These wavelengths are intended to penetrate deeper than topical products alone. It can give you long-lasting results, without causing sun sensitivity. The easy to use device emits 4 distinct wavelengths of light, including infrared. 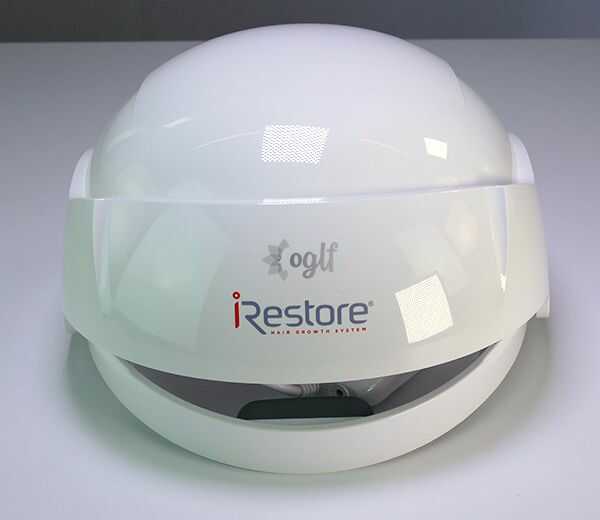 It is designed for simple anti-wrinkle treatment and has a large treatment head, which makes a very efficient and robust anti-aging light therapy solution available without a prescription to treat wrinkles. It is a safe, natural treatment for aging skin, and using it is easy to understand. Cleanse your skin and then apply a serum if you want to. Then, apply the Pure Rayz device to your skin for 3 minutes per area, moving it is a slow, circular motion. Just make sure you keep your eyes shut when treating the area around your eyes. It has an automatic timer that lets you know when to move to the next section. Ideally, give yourself 5 treatments per week for the first 8 weeks, and then for maintenance, complete therapies once per week and as needed. Each procedure takes 3 minutes per area. Gentle enough for all skin types and tones. The Norlanya Red Light Photon Therapy Machine aims to rejuvenate and firm your skin and tone your face, and you give you visible improvement in as few as 4 to 8 weeks. So how will this device help you? 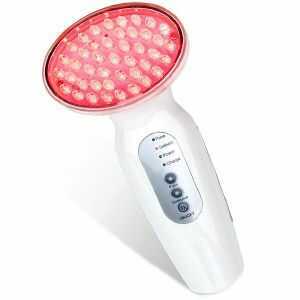 It emits 660nm wavelengths of red light, to boost collagen and elastin production, improving skin problems. It has 2 modes, continuous and pulsed, and it is battery-powered, so it has cordless operation. It cannot be used while it is plugged in, but while this is annoying it is also a good safety feature. It charges from a USB, so you can even charge it up from your laptop! The pack includes goggles, which you will need to wear during treatments, but the red light only turns on when the treatment head is in contact with your skin, to protect your eyes. The RejuvaliteMD is a device designed to give you the benefits of LED technology in the privacy of your home. 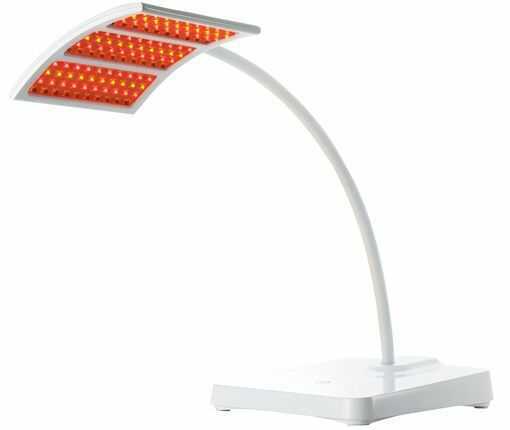 It is an FDA-cleared rejuvenating lamp that looks like a traditional desk lamp, and the device comes with a flexible arm that is mounted on a sturdy base. It is a comfortable device because it only weighs an astounding 6 lbs. The lamp head has three sections, consisting of a combination of red bulbs (660nm), yellow bulbs (590nm), amber bulbs (630nm) and infrared bulbs (880nm). It also comes with additional protective goggles and contains the power adapter plus a user’s manual. Using the RejuvaliteMD is quite easy and straightforward. To use this product, all you need to do is follow the user manual attached to the product after you have purchased it. Before you begin treatment, it is advisable that you clean your face thoroughly. This process will help remove any topical cream or medication. It comes with a flexible arm that can be twisted or adjusted to suit any position you want and can be used sitting or lying down. Directly position the lamp in a manner that the LED display faces the area that needs the treatment. When applying the device, ensure that the implement is not more than six inches away from your skin. NOTE: When you are treating facial skin, you must wear the protective goggles that come with the light. Once you are in position, switch on the device and relax, leaving the area exposed for 5 minutes of treatment. It doesn’t matter if you doze off – it will automatically turn off after the treatment session. Treat each area five times per week, up to twice daily for quicker results. The more you use it in the first 60 days, the better your overall results will be, but once you have completed the initial 60 days, you can cut down to 2 to 3 sessions per week to retain the rejuvenating effects. 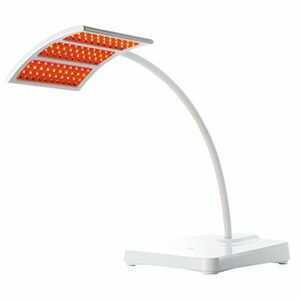 This lamp is very easy to use and it doesn’t use harmful rays or UV light. If you are looking for a larger anti-aging device, this device is a great choice. The reVive Light Therapy DPL II, Full-Face Wrinkle Reduction, LED Light Therapy Panel that has 5mm, medical-grade lights. It is clinically tested and recommended by dermatologists and doctors, and as many as 97% of users in the clinical study experienced a significant reduction in their wrinkles and effects of aging. The DPL II can treat wrinkles on your face, chest, even your back in just a few minutes. It is DA-cleared as an OTC Class medical light therapy panel for reducing wrinkles. It stimulates collagen and elastin, meaning it can support skin healing and recovery from cuts, scrapes and even sunburn. It makes use of two connected panels, so it is adjustable to different angles making it easy to for you to use and for your comfort. Treatment times take just 3 minutes, yet the DPL II can give you unprecedented results. As well as reducing fine lines, wrinkles and crows feet, it has been created even to prevent puffy eyes and dark circles from around your eyes, as well as stimulate the production of collagen and elastin. It can enhance the color, tone and texture of your skin. It is a safe and natural option for achieving a radiant, youthful appearance. The Pulsaderm Red LED is a handheld red light therapy device which can be used to target fine lines, wrinkles and crows feet successfully. It is cleared by the FDA and uses the same technology as that used by NASA to improve the texture of your skin. It has been medically proven to reduce the visible effects of sun damage and aging. It is gentle, non-invasive and painless. Some people even find the treatment sessions relaxing as well as effective! It can give you younger-looking skin in just 30 days! The device itself is small, but it has a relatively large treatment area which covers 4 inches (10.16 cm) of skin. 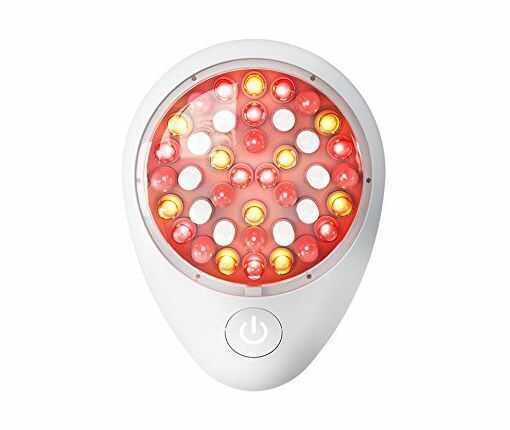 It has 97 LEDs which emit a highly effective wavelength of light intensity for enhancing skin repair. Easy to use, simply clean your skin, then place the device over the desired area and turn it on, holding it in place. The device has an automatic shut off after 3 minutes, which is the suggested treatment for each area, so you don’t need to clock-watch during each session but can sit back and relax instead. While the light is not dangerous to eyes, the glare can cause visual disturbance and discomfort, so it is advised to wear eye protection. This device is supplied with safety goggles for this purpose. It is most effective on facial wrinkles, and can be used by both men and women, but should not be used by children under the age of 14. Best desired results can be achieved after 12 weeks of regular treatment, but you will likely see gradual results before that as you continue your treatment regimen. Even better, the advised treatment times are only three minutes, three times a week, so you won’t need to take much time out of your busy schedule. Red light therapy, or the application of red LED light to the surface of the skin, has become one of the top treatments for skin damage, including the effects of aging. Red light therapy is not sunlight but helps to reverse the harmful effects of too much sun. In the 1990’s red lights were used by NASA as grow lights for plants in space. The LED light used in these devices were ten times brighter than the sun. Therefore, they sped up plant cell production and the photosynthesis process. Red LED lights were tested on human skin in the late 1990’s, and it was discovered that red light helps human skin cells grow faster too. This discovery has led to red LED light usage in treatment for skin damage, acne, irritated rosacea-plagued skin, psoriasis, age spots, wrinkles and skin cancer, or melanoma. What Does Red Light Therapy Do? Essentially, red light therapy speeds up the process of skin cell reproduction and healing. The red rays penetrate deep into skin’s layers – deeper than any other colors. The deeper absorption of red light enhances the cell functions, so cells can grow faster. Collagen and elastin, the proteins that make skin supple and soft, are produced more efficiently, thus helping reduce damage and making the skin feel youthful, firm and healthy. Skin cells regenerate faster with red light therapy, and it can be used to treat many skin problems – from psoriasis to acne, wrinkles and more. It’s a simple, safe treatment with long-lasting results. What Are The Benefits Of At Home Red Light Therapy Treatments? The ability to complete a red-light therapy session at home has many benefits. The most crucial one, is that it is much more affordable than regular dermatologist appointments. Think of it this way: would you rather spend hundreds of dollars and time making regular trips to the dermatologist, or stay at home and do your treatments from the comfort of your couch? Red light therapy treatments save you time and money. They can be completed while relaxing in front of the TV. Treatments can be done in the privacy and comfort of your home. Red LED light therapy can enhance the effects of skin creams and serums that promise to reverse skin damage or anti-aging effects or even replace them entirely. It penetrates both layers of skin to speed up skin cell production and can aid deeper, faster absorption of the products, which is much more effective than slathering on a cream that sits on top of the skin. By eliminating the need for a laborious skin routine, you’ll save time and money and make your wallet happy. How Much Does Red Light Therapy Cost? 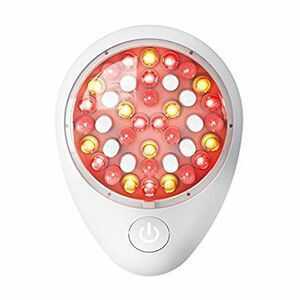 There is a wide variety of red LED light therapy products for at home use. Be prepared to spend at least $50, and even over $1000 for the more expensive, top-quality models. Depending on your needs there are small portable units that are convenient and easy to use, or deluxe home models at take up more space and must be plugged in. Whichever product you choose for at-home use, it is sure to be much more cost effective than visiting a doctor for the same treatment. To help you decide which is best for you, we’ll discuss a variety of models in this guide below. Do you suffer from any skin condition such as sun damage, acne, irritated rosacea-plagued skin, psoriasis, age spots and wrinkles? Are you tired of spending money on expensive “promise-in-a-bottle” creams, or can’t afford expensive trips to the dermatologist’s office? If so, then yes, at-home red LED light therapy is worth the cost. Buying and using a device at home is much more cost effective and easier on time than expensive skin serums and dermatology appointments, and it can even enhance the results you can achieve with topical products. In some treatment plans, red LED lights are combined with infrared and amber-colored LED lights to treat the skin. While infrared isn’t visible to the human eye, red and amber light waves are longer than other colors and reach deeper into the skin. The red LED light waves reach about 1/3 inches deep into the skin’s surface, while infrared penetrates up to one inch into the tissue. Infrared light waves go past both the epidermis and the dermis to reach the skin’s collagen fibers. The red, infrared and amber light waves stimulate skin rapid skin cell growth. This means skin damage that could take months or years to reverse can now take days or weeks. Red LED light therapy leaves skin feeling healthy, rejuvenated and glowing. The skin also becomes soft to the touch after treatment. With collagen and elastin production sped up, the skin will feel firm and supple. Blood circulation is improved, which reduces any redness, swelling or puffiness of the skin. Red light therapy is a truly holistic targeted skin treatment. Red LED lighter therapy is safe and effective for all skin types. However, if you have acne, particulary if it is severe, you may notice it flares up when you begin red light therapy treatments. This reaction is normal and expected. Dermatologists suggest continuing the treatments since the treatments regenerate skin cell reproduction and eventually reduce the amount of acne. What Are The Best Red Light Therapy Products? Before purchasing the best red LED light therapy product for you, make sure you research what is on the market. Determine your budget and skin needs to find the one that will treat your specific skin problems. We reviewed the top eight products on the market. Red light therapy is an accumulative treatment, so try to stick to a plan when you first get your device as you won’t see results overnight. Keep it going for a few weeks unless you experience adverse effects. As we grow older, the rate in which the collagen and elastin – the critical building blocks of healthy skin – slow down. This is one of the main reasons why we age; skin loses its elasticity and suppleness as we lose these proteins, causing wrinkles to form. This can be sped up by, prolonged sun exposure, and other environmental factors can cause skin damage. The sun’s ultraviolet (UV) rays damage tissue, causing premature wrinkles, sun spots and melanoma if left unprotected. While not enough sun exposure can cause Vitamin D deficiency, it’s important to find a balance to have healthy, supple skin that is still protected. One option to combat the visible effects of aging is surgery, but it is quite expensive and carries a high health risk. For those who do not want to undergo surgery or fear the prospect of needles, they may want to lean towards other products that that promises a better-looking skin. A safer alternative which has been successfully used by NASA is red light therapy. The power of LED light cannot be overemphasized. Since the discovery by NASA in 1990 that it affects living tissue, numerous researchers have shown that LED lights that have different wavelengths have slightly different beneficial effects on the skin, which aid in the healing and rejuvenating processes. Over the year, the LED light technology was adopted by dermatologists who were determined to help people gain back their youthful face or at best, a wrinkle-free face. However, the good news is that this technology is now available to all, in the comfort of your own home. Is Red Light Therapy Effective? If NASA has given something a thumbs-up, it must work. Besides NASA, scientists and dermatologists alike all agree that red light therapy can truly speed up healthy skin cell production and reverse damage. When NASA tested red light therapy, they used LED lights and hyperbaric oxygen and found that the LED lights alone sped up the healing process. There have been several studies and controlled trials to determine the effectiveness of red light therapy including a study by the National Center for Biotechnology Information which concludes high patient satisfaction.